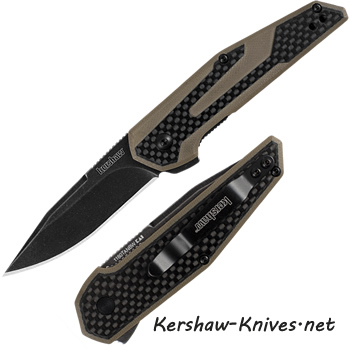 Kershaw Fraxion 1160TANBW. This contemporary and compact knife was designed by Danish knife and toolmaker, Jens Anso. It has a sleek and slim design that weighs considerably less than other comparable knives. It features a 2.75 inch black-oxide BlackWash™ finish blade made of 8Cr13MoV steel and a tan G10 handle with carbon fiber overlay. This is a manual knife, but can be opened quickly with one hand with the built-in flipper. It also features a reversible deep-carry pocket clip.